Each week, Bob Gaughan wraps up the college football Saturday with an emphasis on what matters to WNY fans: Quarterbacks and UB. Wyoming’s Josh Allen was at the start of the season picked to be the number one player in the draft by some people. I can’t see that happening after a horrible start to the season. In his defense he gets little or no help from the people around him, but the numbers are ugly vs Power 5 teams. Saturday was the worst as Oregon destroyed Wyoming 49-13. Allen was 9 of 24 for 64 yards and an interception. He did rush for a score. He’s played three power 5 schools the last two years and here are his combined numbers. He’s had 48 completions on 96 attempts (50% Completion) with one Touchdown and eight interceptions. Ouch! What’s worse for Allen was on Saturday twenty-one scouts from sixteen NFL teams were in Laramie to watch his performance. Maybe the pressure got to him. NFL prospect that looked good in front of the scouts was Oregon RB Royce Freeman who ran for 157 yards and three touchdowns. Mason Rudolph shined again this week as Oklahoma State destroyed Pitt 59-21. Mason Rudolph was 20 of 28 for 423 yards and 5 TD’s in the first half. You may not think this is too impressive but remember Pat Narduzzi is the Pitt coach. The former Michigan State defensive coordinator just last week held Penn State and Trace McSorley to 164 yards passing for the game on the road. In a rematch of the greatest Title game of all-time it was the defenses that ruled the day for most of the night. USC squeaked by Texas 27-24 in double overtime. Sam Darnold wasn’t great but at the end of the night he threw for 397 yards and three touchdowns. He engineered scoring drives as time expired at the end of the half and regulation. He did have two interceptions again, but ultimately he gained a victory for the Trojans. Darnold remains the leader in the clubhouse for top QB in the draft. On a side note Texas may have finally found a new QB. Sam Ehlinger, a freshman from Austin, came up big passing for 298 yards in a the loss. This Texas team looked nothing like the team that two weeks ago lost to Maryland at home. Josh Rosen made two critical interceptions in the second half that cost UCLA a hard fought entertaining 48-45 loss in Memphis. Rosen’s number weren’t horrible he was 34 of 56 for 463 yards and four touchdowns. However he threw late over the middle in the third quarter and Memphis LB Tim Hart returned it 60 yards for a pick six. Then in the fourth quarter when UCLA was in FG range to tie he threw off his back foot in the red zone and got picked off again. Riley Ferguson of Memphis looked great against a suspect UCLA defense. Ferguson threw for 398 yards and 6 TD’s. Throw Ferguson’s name in as a potential draft prospect. The Clemson defensive line is the best in the country. I’ve told you in previous weeks that the Louisville offensive line is weak. This was going to be a tough night for Lamar Jackson. Jackson had only 118 yards passing through three quarters as Clemson built a big lead and cruised to victory 47-21. Jackson padded his stats in the fourth quarter and for the night threw for 317 yards. 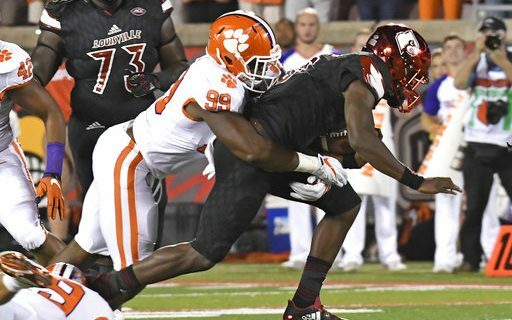 The best two NFL prospects on the field were Clemson DT’s Christian Wilkens and Dexter Lawrence. Clemson looks like it has the best defense in the country. Remember last week Auburn’s QB Jarrett Stidham only had 37 yards of offense against them. Butch Jones was on the hot seat to begin with in Tennessee. After allowing a 63 yard Hail Mary to end the game against Florida to lose 26-20 the seat got hotter. Question for Butch, “What were your Safeties doing?” How Tennessee could allow WR Tyrie Cleveland to get behind them is unexplainable. The Vols had no business losing this game as they threw interceptions in the end zone and missed easy field goal attempts. How’s this nugget from 2014. Butch Jones had Josh Dobbs, Nathan Peterman and Riley Ferguson as QB’s at Tennessee and he started Justin Worley. UB gained their first victory of the season with an easy 33-10 win over Colgate. The Bulls scored on their first five possessions to build a 30-3 halftime lead. Emanuel Reed rushed for a career high 120 yards and a touchdown. Tyree Jackson was a man amongst boys. Jackson threw for 184 yards and rushed for 97. He combined for two touchdowns. The Bulls are home again next week against Lane Kiffin and Florida Atlantic.